C is the secondary reflection. This diagram is unsatisfactory in several ways. 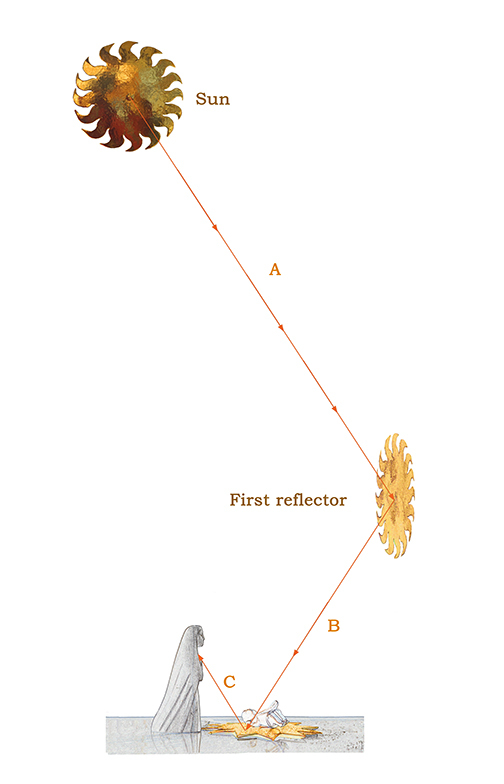 I have shown the reflector [the star] in a vertical position to clarify how the sun is bouncing off it. It could of course be tilted at any appropriate angle. The secondary reflector [the sunburst on which the child is lying] is necessarily horizontal. To keep the layout manageable, the diagram assumes the sun is behind the waggon. The principles would be the same if the sun were in front of the waggon, but the reflector would have to be differently positioned and tilted. It also manages to suggest that the sun has a very narrow beam, whereas the size of the eventual spotlight of course depends on the size and tilt of the reflector, and the curve on its surface area. Since the drawing is 2D, it cannot show the different directions from which the reflector could be angled. This would be even more effective in the Transfiguration, where the brass bowl could be positioned anywhere in the playing area. Experiments with the scale model suggest that it is more effective the lower down it is, but this might be difficult with a standing audience. Scroll down for photo of reflector. 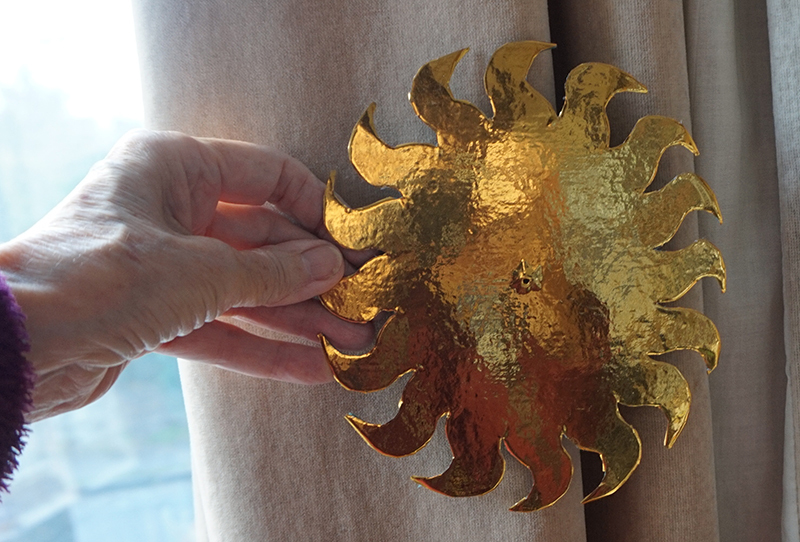 Sunburst made of cardboard covered with gold Fablon. Highly reflective. Rubbing the Fablon onto the cardboard has texturised it with the grain of the underlying card, which scatters the reflection slightly. I have experimented with others covered with gold leaf and tinfoil; also a genuine (Indian) brass bowl as recommended in Revello, but being bought for scale, it is too small to be very efficient in catching the light.